← Soon Forget: What (was) UNIT:E? 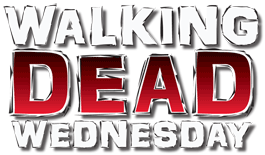 For this year's final Walking Dead Wednesday, we're goin' super-sized. AMC's The Walking Dead the TV show wasted no time in getting the fan-favorite Michonne into the series - there were even plans to have her cameo in the pilot, though that obviously didn't come to pass. Still, she appeared much sooner in live-action than she did in the comics. 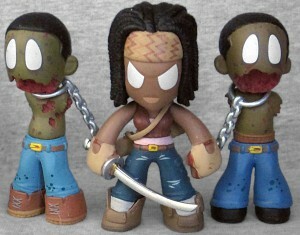 And the Walking Dead Mystery Minis probably would have done the same thing, if they weren't prohibited from including any "comic" characters in Series 1. 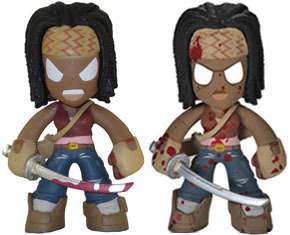 You can tell, because when that restriction was lifted for Series 2, Funko immediately included three versions of the character: "plain" and "angry" Michonnes, which were both available in a standard 2:24 ratio, and then the ultra-rare 1:144 bloody variant. They all have the same sculpt - it's just a question of paint apps that creates each different variation. 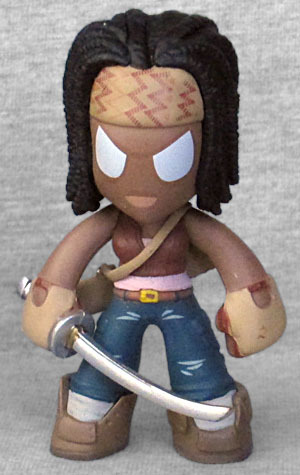 Michonne's look translates easily to the Mystery Minis' simplified, iconic style. Her dreadlocks were clearly individually sculpted, then placed on the figure's head. She's wearing her bandana, a leather vest over a pink shirt, blue jeans, and her boots are only laced half-way up, because the tongues are falling over the top. She's got her fingerless gloves, and the scabbard for her katana is slung over her shoulder. Amusingly, while the Angry Michonne has blood on her sword, Bloody Michonne does not. 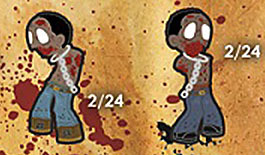 Both of Michonne's pet zombies are available in a 2:24 ratio, so theoretically it will be easy to complete the triad. Unfortunately, the two look so similar (there are only so many ways to do "shirtless black guy with no arms or jaw") it can be difficult to tell which one you already have. The art on the box makes it look like they'll have distinctly different postures, and while the final figures do have a little of that, it's not as extreme as the art suggests. So let's look at what differences there actually are - since none of the Mystery Minis have official names, we'll just call these "Mike" and "Terry" in the order I picked them up. Mike is the taller of the two - but he's also standing up straighter, so maybe that's just an illusion. His hair is longer, and the hairline is sharp. There's dirt and (sculpted) cuts on his torso, but no major wounds. His jeans are dark, and the brown boxers sticking out the top have a sculpted plaid pattern. He's wearing black shoes. Terry has smoother hair, but his hairline is more rounded: it curves around the front of his forehead, rather than going over the top. He's slightly hunched over, and has more dangling skin around his mouth-hole. Although he's also got sculpted boxers, they don't get their own paint app, so they're just the same light blue as his pants. He's wearing brown boots, and has several significant holes in his chest. So the easy way to identify them is "black shoes/dark pants" and "brown shoes/light pants." Both pets have a ring around their neck and a chain hanging from it. Obviously Michonne can't actually hold the chains, since her hands don't open, but but because they're molded plastic, you can point them at an angle and hide the ends behind her fists, to nicely fake the appearance of control. I'm always amazed at how, as the comic progresses and becomes less "comic-booky," Michonne continues to survive, until she's so out of place that she sorta-kinda gets temporarily written off. I honestly wonder when they're going to pull the trigger and kill her.